They have a lot of rules about food in France. One of the most intriguing is that you can only eat oysters during months with the letter “r”. So that rules out “mai”, “juin”, “juillet” and “août” (note that circumflex indicating a lost “s” again – remember in Blèsoise? The word for oyster, “huîtres” also once had an “s”). Now that just happens to coincide with summer when the cold chain is easily interrupted and you’re more likely to find oysters that haven’t survived the journey from the coast. Today, with modern refrigeration, there’s absolutely no reason not to eat them but you’ll find they disappear entirely from most fish mongers, markets and restaurants in Paris! So we eat oysters every Sunday except during months with the letter “r”! I had two contacts with oysters when I was growing up in Townsville. Mum used to buy them in bottles which I found very unappetizing and we used to scrape them off the rocks on Magnetic Island (or “the Island” as we called our little paradise) during the summer. Already a step in the right direction, although they were pretty salty. 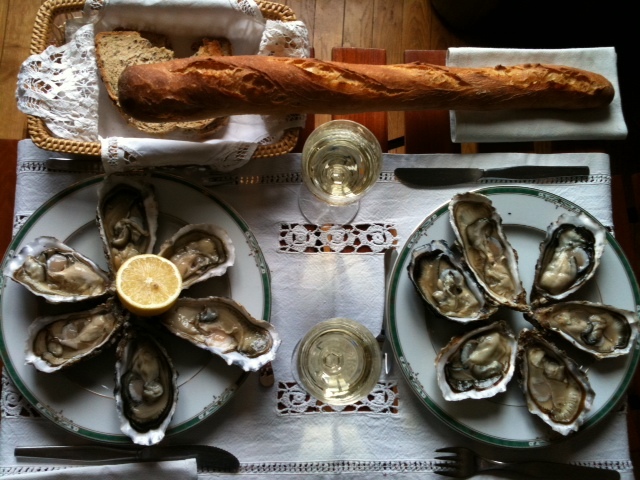 So nothing prepared me for oysters in France. First, they are always alive, whether you buy them on the market or eat them in a restaurant. That’s not necessarily true in Australia where I’ve eaten them dead in their shells on a bed of ice. Not exactly to my taste. Now, if you don’t like oysters, you should stop here as some people are a bit squeamish about the details. To check that an oyster is alive (you have to shuck it first), you take a sharp knife and tease the outer edge. You can use a squeeze of lemon too. If it retracts a lot, it’s probably lost a lot of water already and is getting old. If it doesn’t retract, it’s dead and you should throw it out. Our favourites are the ones they call “spéciale”. They’re fattened in small numbers in deep oyster parks and have a sort of sweet salty lingering taste they call « noisette » (hazelnut) in French. The most exclusive is the “gillardeau” which is cultivated for four years and is grossly overpriced but there are plently of others from the Cotentin area of Normandy. We like the « spéciales » from Blainville that we buy from the oyster vendor at the bottom end of the Sainte Eustache market on a Sunday. For a little extra, you can have them shucked. Oysters in France are numbered from 3 to 1, with 3 being the smallest, and the ones from Normandy are usually sold by weight. The “spéciales” have this nice little pinkish plump bit while the regular “fines de claires”, so-called because they are fattened in oyster beds called “claires”, have a greenish tint to them and are much saltier or “iodé” (full of iodine) as they say here. I’ve never been able to get anyone to really explain the difference between “iodé” and “salty”. We had a disappointing experience in Australia with fresh oysters. 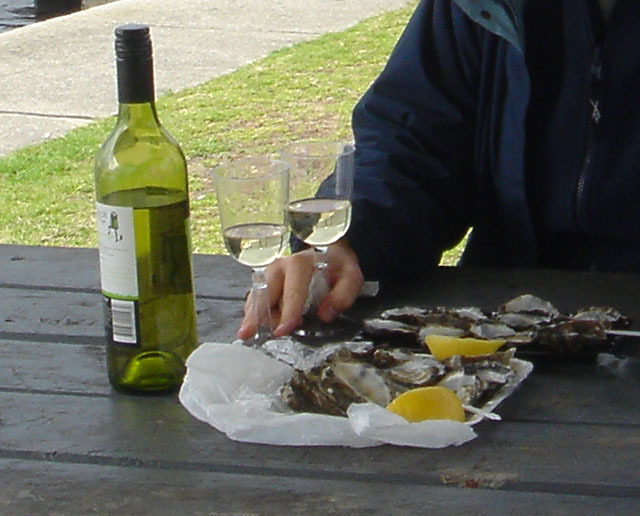 We were at Tea Gardens on the northern coast of New South Wales and were told, to our great surprise, that we couldn’t buy live oysters ourselves and had to have them opened by a licensed oyster seller. 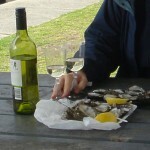 We were directed to “The Oyster Hut” where we were able to buy some local oysters which we ate at a picnic table with a nice cold bottle of sauvignon. We didn’t have glasses but the girl in the bottle shop found us some long-stemmed plastic ones. The oysters were disappointing though. Not very tasty and not particularly fresh. It was only 10.30 in the morning, I have to confess. On Sundays, we eat a dozen “spéciales” each, with bread and butter, home made for me (the bread, I mean!) and baguette traditionnelle for Relationnel (see Beret and Baguette) and drink Sancerre, which is a delicious sauvignon from the east end of the Loire. 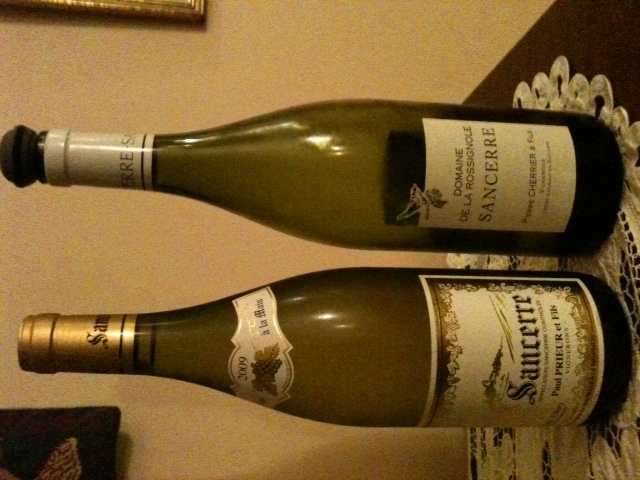 Our favourites, both bought directly at the vineyards, are Domaine de la Rossignole and Paul Prieur. On ne s’emmerde pas, as they say. 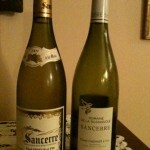 This entry was posted in Food, Wine and tagged baguette, fines de claire, oysters, sancerre. Bookmark the permalink. I thought about your oyster post today since my husband was just given oysters as a Christmas gift from his company. Unfortunately, it’s not the best gift for us. My husband has some kind of intolerance. I guess it’s not technically an allergy but the result is pretty much the same. As for me, to put it mildly, I’m not a fan. I’ve tried them twice. Two different kinds. I really don’t get why people like them so much. The texture is not appealing and they taste like seawater to me. I feel like I’m missing something in a way because so many people like them! What a pity! I wonder if you’ve tried the “spéciales”? I don’t think much of the ordinary “fines de claires” which I agree are very salty and of not much interest at all. Have you tried them grilled in the oven? Do you like seafood in general?